​​1. The Glorious Food - Indian, Chinese, Malay and more. Let's be honest - food is always going to top my travel lists. Kuala Lumpur is in particular a favourite culinary scene of mine, due to the eclectic mix of influences from various cultures - including Malay, Chinese and Indian. Only downside? With the mouth-watering range of choices at your fingertips you'll be hard pressed to decide what to try! My favourite: a dish of fried Hokkien meet, especially if eaten fresh from a street vendor. 2. The Fabulous Shopping - eat your heart out Milan. From the multi-floored, towering shopping malls, to the bustling street markets which spring to life come sunset, everyone is sure to find something to fill their shopping basket. For something a little fancy (yes, Gucci, I'm looking at you) Suria KLCC Mall beneath the Petronas Towers in KL is a must. And for those who (like me, ahem) need to stretch their budget on some genuine fakes, the Batu Ferringhi Night markets will cater to all your needs. 3. The Stunning Tourist Sties - excuse me New York and Paris, please step aside. Want to see stunning 360 degree views of a sprawling metropolis? Forget the Empire State Building and take ea mirrored elevator ride up to the top of Kuala Lumpur Tower to the in the breathtaking city vista. Want to ride a funicular up to stunning views? Who needs Sacré-Coeur when you have the natural splendour of Penang Hill to delight the senses? And think a Golden Pavilion is a splendid sight? Sorry Japan, but the colours of Kek Lok Si Temple will fill any traveller with awe; especially during Chinese New Year celebrations when the temple is overrun with a sea of lights. 4. The Non-Stop Entertainment - the kids will forget all about Disneyland. Kids tagging along on your trip? Or are you just a big kid at heart? Never despair, Malaysia has a host of attractions that will keep boredom at bay. Legoland and Sunway Lagoon are both must-visits, but my personal favourite is Cosmo's Worlds - the largest indoor theme park in the country. The Fantasy Garden has cutesy rides for tiny tots, while the Galaxy Station is the home of the thrill seekers, and even boasts the largest inverted coasting in the Asia-Pacific. The park is also conveniently located within Berjaya Times Square shopping mall, which means once exhausted from circling the coasters, you can indulge in some much needed retail therapy. 5. The Magnificent Beaches - where's Greece again? Think you need to visit Santorini to experience white sand and crystal clear water? If you do you would be completely misguided, as Penang has a host of beautiful beaches that rival any of those of the Greek islands. My pick? Money Beach - less than half an hour by boat from Batu Ferringhi - is a secluded paradise where you can forget that the outside world event exists. Take one of the excursions out to spend your day soaking in the sun's rays, trying your hand at catching some fish, and then dining no the freshest barbecue you'll ever taste. 6. The Just Plain Quirky - Harajuku ain't got nothing on you. Think Japan is the only home to the weird and wonderful? You'll change your mind after finding some of the quirky ways to fill your day while in Malaysia. 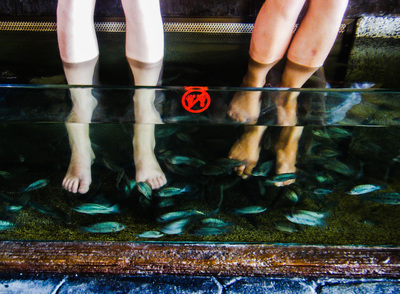 If you're staying at Batu Ferringhi I highly recommend you indulge in a little relaxation a la fish, and spend a relaxing afternoon having your feet (or full body if you're game) nibbled on by a school of little guppies - in the name of beauty and good health of course! I still maintain that I'm not sure what it is that I ate that night, but it was shaped like a teddy bear so I don't really mind. I don't think that I need to tell you that Japan is one interesting country - but Maid Cafe's just add to the claim. But what is a Maid Cafe you ask - well I visited one, and I must admit I'm still not entirely sure. What I can tell you was that it was a whole lot of fun. I've been told that the cafe's have been popping up around Tokyo since the early 2000's, as an 'obvious' extension of the anime and manga craze of the nation. These cafes - staffed entirely by youngish women decked out in frilly skirts, cat ears, lace and glitter - seem catered towards a male audience (at least, from what I saw during my visit) but don't let that make you think that there is anything seedy about them as we first thought when we stumbled into Maidreamin on our first night in Shinjuku (at least, the seediness is hidden behind kawaii cuteness). The rules are pretty strict - no photos of the girls, no touching the girls and no asking for their phone numbers (assumedly the guys are into this....). What you do get however is an entertaining hour (yes, you pay by the hour. yes, I still stand by the point that this is not what you think it is.) where your food is decorated with cat pictures and your drinks are accompanied by a song and dance (beware, you won't be allowed to drink until you join in.). These places are still largely geared towards locals, and as such we found ourselves fumbling with language barriers, but that was half the fun. If you want a true crazy Japanese experience look no further. Spending some time in Tokyo and want to escape the bustling city confines for a day? Look no further than the town of Kamakura, located just over an hour out of the city in the Kanagawa Prefecture, and easily accessible via JR train lines. When tossing up ideas for day trips the usual culprits generally come to mind - Kyoto, Nikko, Hakone - just to name a few. Not one of my many well Japan-travelled friends mentioned the coastal town of Kamakura, which is why my companion and I were pleasantly surprised by the wealth of culture and things to do which the town afforded. Check out the Great Budda of Kotokuin, the second largest Budda in Japan: for twenty yen visitors are even able to enter the centre of this monument which is over seven hundred years old. Go temple crazy. If you enjoyed Kyoto for its plethora of temples and shrines, you'll love Kamakura. Hasedera Temple and Hachimangu Shrine were my personal favourites, but these are only two of many. Take a stroll along the beach. If the weather is treating you well, a stroll along the beach, dipping your toes into the warm waters, is a must. If not, hitting up one of the many beachside cafes and bars is still a must for lunchtime! Visit Enoshima Island. Take a short train journey (20 minutes) from Kamakura Station over to the island of Enoshima. Hike through the lush surrounding, visit the many more shrines the island has to offer, or explore the depths Iwaya Caves or relax at Enoshima Island Spa. From Tokyo Station: This is the route I personally took, catching the JR Yokosuka Line directly from Tokyo Station to Kamakura Station (make sure to ride all the way through, and not get off at Kita-Kamakura Station, the station before the city centre). The journey takes approximately 70 minutes, and is free for holders of the JR Pass or 920 yen for all others. From Shinjuku Station: For a direct link from Shinjuku Station to Kamakura Station catch the JR Shonan Shinjuku Line, also costing 920 yen and taking just over an hour. Make sure to catch a train bound for Sushi for direct access, otherwise you will be required to transfer to another line at Ofuna Station. Via Odakyu Railways: Buying an Enoshima Kamakura Free Pass will enable you to take the Odakyu Railways roundtrip from Shinjuku to Kamakura, and also gives you free assuage of the Enoden Train (the train line within Kamakura) for 1470 yen. If you already hold a JR Pass I wouldn't recommend this option, but for none pass holders it can be a good money saving move. Relax. Fun. Laugh. Oh, and be eaten by fish. You dine on fish, why not return the favour and let them dine on you. Happy Feet, Penang Fish Spa in Batu Farringhi lets you do just that - as do many other fish spas around Asia. The concept is simple – the Garra Rufa fish nibble away on your dead skin cells, leaving your feet soft and supple. If you’re super game you can even head down first thing in the morning, to offer up your entire body as their breakfast. It works wonders on tired feet, however it takes a while for the ‘relaxation’ to actually begin; the first half hour is instead devoted to ‘laughter’. Luckily 'fun' is felt the entire time. I’m not sure that I’d be game enough for the whole body spa (I can’t even make it through a normal back massage without jerking with laughter) but the foot spa was certainly an experience I’d take part in again. 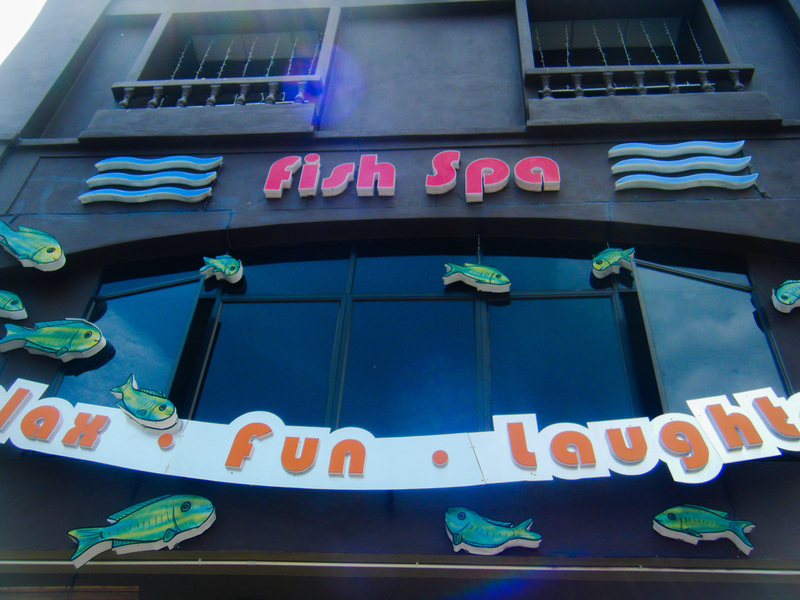 Relax, fun, laughter - the name really does say it all.